While Anthony Mackie has long been confirmed to appear as Falcon in Captain America: Civil War (expected in May of next year), his presence had yet to be solidified in the upcoming highly-anticipated Avengers sequel, hitting theaters May 1st. That is, until now! 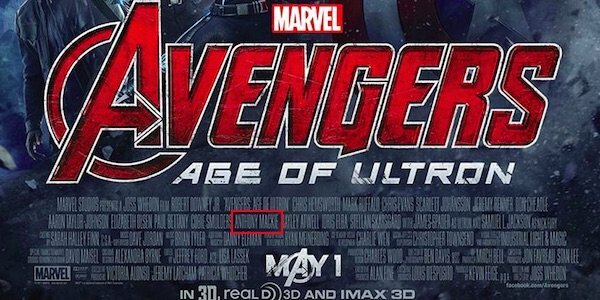 With the release of the new Avengers: Age of Ultron poster, it is apparently etched in stone (or to be more accurate, written on paper) that Mackie will appear in the film. Prior to today, we could only speculate on Mackie's inclusion in the Avengers: Age of Ultron film, but now, thanks to the official poster release, we can lock it down. If you haven't yet seen the amazing yet extremely crowded-looking poster, check that out here… and start getting pumped! While Falcon's image didn't make the cut on the poster (I mean, was there really any room for him anyway? ), his name at the bottom promises the flying martial arts expert will at least make a cameo appearance at the very least. Up to this point, the always-excited actor has been very tight-lipped about his appearance in future Marvel films. In a recent interview, when discussing the future of Falcon's presence in the Marvel Cinematic Universe, specifically in Avengers: Age of Ultron, Anthony Mackie (per the usual) kept the information very close to his vest, only saying he "hopes" he will be included. He elaborated, saying he is pretty much game for appearing in anything and everything Marvel to the point that he would even fly himself out to "shoot whatever scene they want" him in. When discussing rumors that he was set to appear in the Paul Rudd-led Ant-Man, he again said he "hopes so." He even took things one step further, joking about the prospect of showing up in Thor 3, Guardians of the Galaxy 2 and Hulk 3 (provided the lattermost happens), where he again said, yep you guessed it, "I hope so!" While Falcon's presence in future MCU films may be not be certain at this point, we do know for sure that he will be donning a killer new costume in the 2016 Captain America: Civil War. One can only assume since his last getup was destroyed at the end of the Captain America: The Winter Soldier that he will have no choice but to also sport it for his role in Avengers: Age of Ultron. Whether or not he plays a vital role in the film remains to be seen but at least we can count on his appearing in style. Really, though, the big question for Mackie has nothing to do with his Falcon costume but rather his Captain America costume. Will the man ever wear it? I'm guessed when asked, he'll likely say he "hopes so."